The model beer engine was made by William Stokoe (whose granddaughter-in-law donated it to the Worcester City museum collection in 2001) a water engineer working around Worcester circa 1900, and is thought to be an apprentice piece made by Mr. Stokoe during his training. 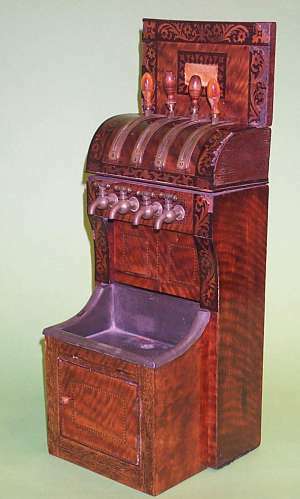 The beer engine is believed to be a miniature copy of the type of pumps used to raise beer from the barrel to the glass in a traditional public house. The beer engine has a wooden case decorated with floral marquetry. Inside the lower case are four working brass valves connected by rods to four working levers on the curved upper section of the case. The valves are also connected to four taps on the front of the model; below the taps is a lead lined sink with a small drainage hole. Access to the lower case and the drain is via a small door on the case front. If you would like to see other examples of 19th century beer engine, including a working one-third scale tradesman’s patent sample, visit Hotmog’s Victorian Breweriana at http://www.victorian-breweriana.me.uk/.